Flexography is the ideal process for applying these features because of its accuracy, speed and versatility. Using a flexible polymer relief plate that can be imaged relatively cheaply, it applies a wide range of media including ink, varnish, silicone and glue to a variety of substrates including plastic, metallic film, paper, cellophane and non-woven substrates. Moreover, units are available that can be customised to integrate seamlessly and perform with stability with manufacturing lines for many industries at speeds of between 10m/min and 1000m/min. 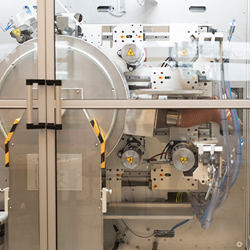 Flexo is capable of achieving precise and uniform laydown at speeds between 10m/min and 1000m/min, thanks to ancillary equipment including a supply system and chamber doctor blade, to automatically control flow and viscosity. controlled ink supply and the design features of the printing unit that facilitate stable printing. Custom-designed flexo units can be retrofitted with virtually any converting machine, optimisin manufacturing processes in markets as diverse as household chemicals, feminine hygiene products, wallpapers, direct mail publishing, cigarettes and food. For some industries, an integrated unit leads to the development of new products. One example is baking paper with anti-slip properties. A 1.4-metre unit features a rotary screen system to apply silicone dots of between 5 and 8µm thickness to the back of the paper, providing a grip for the baked products. The paper is then slit to approximately 300mm-widths. Because flexo provides a positive (relief) print, the process is capable of high resolutions for printing high-quality wallpaper designs. Furthermore, plate and imaging costs are lower than those for screen, and printing speeds are faster. TRESU has designed a twin-station unit with air dryers for printing the design and wallpaper edge used for accurate positioning on the wall. Carbon fibre chambers with corrosion-resistant surfaces are used as the inks have high pH values. A fire-retardant water-based coating applied to cigarette paper ensures the cigarette extinguishes after burning for a maximum of 9mm if smoke is not inhaled. Flexo is a more reliable alternative to the conventional method of applying the coat with spray nozzles, which have a relatively high risk of clogging, and low assurance of consistent coverage. The flexo unit’s circulator assures viscosity control and uniform coverage across the web. TRESU custom-built the coating unit together with an unwinder, slitter and rewinder for a German customer. The rolls of coated papers are then supplied to the cigarettes manufacturing facility. Perhaps the fastest flexo application, of up to 1000m/min, is the application of glue in direct mail production. TRESU has built a unit for gluing the webs together during the production of a superstore’s weekly brochure for promoting bargains. The unit applies glue to the front and back sides of four webs just after they converge. Stability is achieved with rollers that function without gears and at a high rotation. Working with a co-supplier TRESU supplied an anilox roll with cells in a wave-formation to transfer the glue stably at high-speed, as well as chilling units to maintain temperature below 30°C. Including the printing process within the production line, with a flexographic printing unit between the converting and unwinding operations reduces setup times and waste, shortens lead-times, and allows more frequent design change with greater flexibility. There is also no need to rely on a third-party print supplier, simplifying logistics and reducing materials costs. TRESU, a global manufacturer of flexo units and ancillary equipment, has decades of experience providing a ‘total-system’ approach to integrate the printing process smoothly within existing manufacturing lines. It also provides installation management, training and technical support, so the user gains optimum value from the investment. Given the breadth of possible applications, there is no ‘standard’ printing or coating unit for integration with a manufacturing line: almost every situation is unique. The first stage in the retrofitting project is a consultation with the customer to understand the many parameters that affect the design. The application itself is has implications for the viscosity of the coating medium and thus, type of supply system used. Other considerations are width, production speed, available floor space, and the design of the manufacturing line. The units may be in widths ranging from 185mm to 4.8 metres, comprising one to six printing or coating stations as required. Machines can be adapted for UV, water-based, solvent or solventless media, as well as roll-to-roll, roll-to sheet, and multi-web paths. Units come with drying and curing systems, as well as complementary equipment such as rewinders, unwinders, turn bars and bridging equipment to ensure smooth integration. Direct inline - the unit is integrated into the manufacturing line directly after the unwinder, before the web undergoes the converting process. The manufacturing line is extended to accommodate the printing unit by moving the first segment of the line. 90° Inline Printing Unit - the printing unit is positioned about next to the converting line from a right angle. After printing, the web passes over a bridge with a 3m drying unit. before descending to the converting line with the aid of a turn bar. Parallel – where the unwinder and printing unit are configured so the web runs parallel to the converting line. Mezzanine - the printing unit may be integrated directly into the main frame and guarding of the converting machine. Air drying or curing units are included between each station, with ventilation to ensure all moisture is extracted from the material before conversion. Sensors monitor and automatically control ventilator temperature and humidity. Efficiency is optimised by using a relatively high air velocity and a relatively low heat, and recycling of approximately 85 per cent of the air with an extractor. For some applications, a relatively low drying temperature avoids the risk of tension loss due to loosening fibres. Clean, uniform and accurate delivery of the coating media to the material is assured, without manual intervention, thanks to the supply system and chamber doctor blade. Extensive automation and fast-change features into the unit, to ensure optimum process control, fast setup times and low maintenance. TRESU’s F10 iCon supply system with automatic cleaning, ensures the coating medium or ink is constantly fed the printing units at optimum viscosity, temperature and pressure levels. It feeds a sealed, chambered doctor blade system at a controlled pressure that prevents air contamination, to ensure a foam-free, clean transfer. This also prevents leakage, minimising cleaning times and emissions. The chamber’s eccentric clamping system allows safe, single--minute blade exchange. Additionally, the supply system performs automatic cleaning cycles changes with minimal loss of ink. During an change cycle, which takes no more than 15 minutes, the remaining ink in the chamber is returned to the pump. The chamber and anilox roll are thoroughly cleaned to remove residue, and the new colour is introduced, automatically. A control system stores and, in the case of repeat jobs, instantly recalls job recipes, so no re-entry of ink and calibration data is needed. For customers working with a variety of inks and varnishes, TRESU technicians are available to build a unique database of recipe settings for each job, including, among others, impression settings, print levels, flow rate, air velocity, temperature and register coordinates. Units come with an intuitive human-machine interface for easy operation. Information from the HMI can also be viewed at the interface of the converting line’s main control panel. As a versatile process capable of high speeds and high-definition graphics, therefore, flexography is ideal for inline functional or decorative printing. TRESU flexo units with integrated ancillary equipment, enable manufacturers to apply features that enhance the safety, convenience and brand presentation of their products, while preserving optimum performance of the converting line.